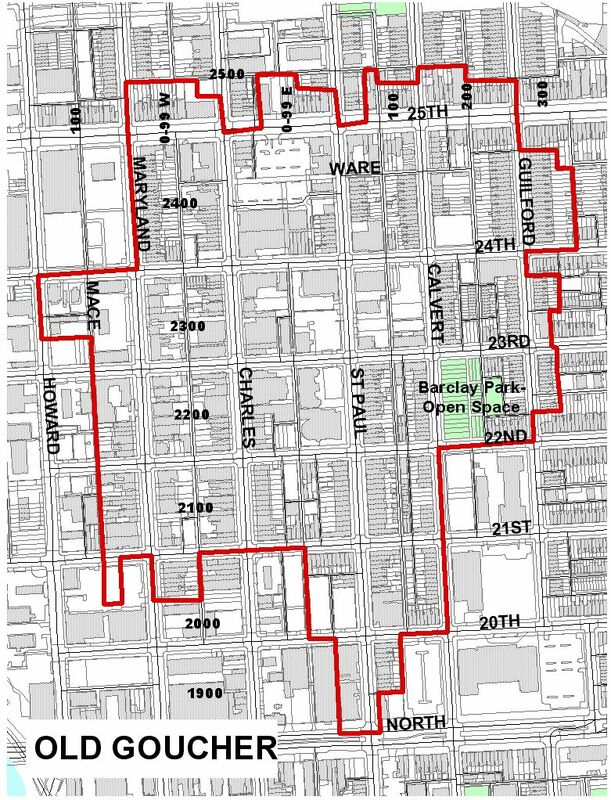 The Old Goucher College Historic District (expanded) is an approximate 18-block area in the middle of Baltimore which developed in the late nineteenth and twentieth centuries. It is characterized generally by two and three story brick row houses constructed mostly in the nineteenth century and several large scale institutional and commercial buildings dating from both centuries. Stylistically, the area is characterized primarily by Italianate, Romanesque, Colonial Revival, and Art Deco influences. The principal streets run north and south with 25th Street at the tip going east and west. North Charles Street, the city's major axis street, travels the middle of the district. The buildings to the east of Charles Street generally stand at the lot lines by the sidewalks. On Charles Street and west, the buildings have deep setbacks. The southeast corner is characterized by four large scale stone churches (Lovely Lane United Methodist Church, St. Michael and All Angels Episcopal Church, St. Mark's Lutheran Church, and the Seventh Baptist Church) along St. Paul Street. These churches dating mostly from the nineteenth century are Gothic, Italianate, and Romanesque in style. Running east and west at the center of the district are a series of large scale, multiple story brick and stone structures built for the Women's College of Baltimore. Present-day Goucher College is now located in Baltimore County. Scattered throughout the district are several free-standing houses, generally large in scale, and several other free-standing commercial and municipal buildings: including two nineteenth century Victorian schools, a 1930's Art Deco Board of Education office building, a turn-of-the-century brick firehouse with Romanesque decoration, and a 1930's Art Deco automobile show room on Charles Street. Many of the row houses have been converted for commercial use and apartments. Some have had commercial fronts added over time. Although compromises to the integrity of the district are very much noticeable, the district overall still reads as a late nineteenth century and early twentieth century Baltimore neighborhood in scale, plan, and buildings. Old Goucher College Historic District (expanded) is significant for its association with the history of Baltimore and the architectural character of the buildings, which stand in it. The district was developed during a period of rapid growth. The city's population was increasing by about 100,000 each decade from 1870 through the 1950's. In 1888, the city annexed a twenty-three square mile region to the north and west. This annexation nearly tripled the landmass of Baltimore. The Old Goucher College Historic District was bought into the city by this annexation. Mostly vacant land at the time of the annexation, the district was almost fully developed by the turn of the century. It developed as a prestigious residential and institutional neighborhood with commercial overtones. The residents were generally of a professional class. Goucher College, formerly Women's College of Baltimore, was established here. Architecturally significant examples of the major styles, which characterize Baltimore, are found here. Of particular note are an Art Deco automobile showroom, the Romanesque Lovely Lane Methodist Church, St. Michael's and All Angels Episcopal Church, and a municipal firehouse. Three buildings designed by the nationalally famous architect Stanford White are found here, as well as examples of work by prominent Baltimore architects. The period of significance covers the period from construction of the first extant building to the start of World War II when the general character of Baltimore began to change visually and culturally with the growth of the suburbs.